As we do each year, Hixny surveyed our users earlier this spring to learn how they’re interacting with Hixny, what they’re using the health information exchange (HIE) to accomplish and what they think of us. Some of our hunches were confirmed. For example, we’ve seen an uptick in the number of times users access data this year, which we thought was a result of the new and improved login process we implemented for our web portal—and many respondents said that logging in to the portal is easier now. Also, as we expected, the greatest number of respondents rely on Hixny for discharge summaries, lab results and emergency department reports, followed by routine medications reconciliations and similar tasks. The most important thing we saw, though, was a trend that’s very encouraging. Many more of our users are finding data through Hixny as their primary resource, instead of using old methods like phone calls, faxes and direct messages to other providers as their first approach. Use of Hixny to more quickly and securely access important patient health information doubled among survey respondents, while calling and faxing decreased by 20 percent. This is a big deal for two reasons. It indicates increased use of Hixny across practices and organizations, which helps improve the quality and comprehensiveness of the data available to all participants. And it indicates that our users appreciate the faster access Hixny provides. We’ve been working hard over the last year to help make it easier for our users to access the data they need through Hixny, so we were very pleased to see those efforts paying off! Bar graph describing the increased use of Hixny between 2017 and 2018. The X-axis shows the different methods users access their data; Call or Fax, Hixny and Other. The Y-axis shows the amount of survey respondents. There was a trend showing that many more users are finding data through Hixny as their primary resource instead of phone calls, faxes and direct messages to providers. 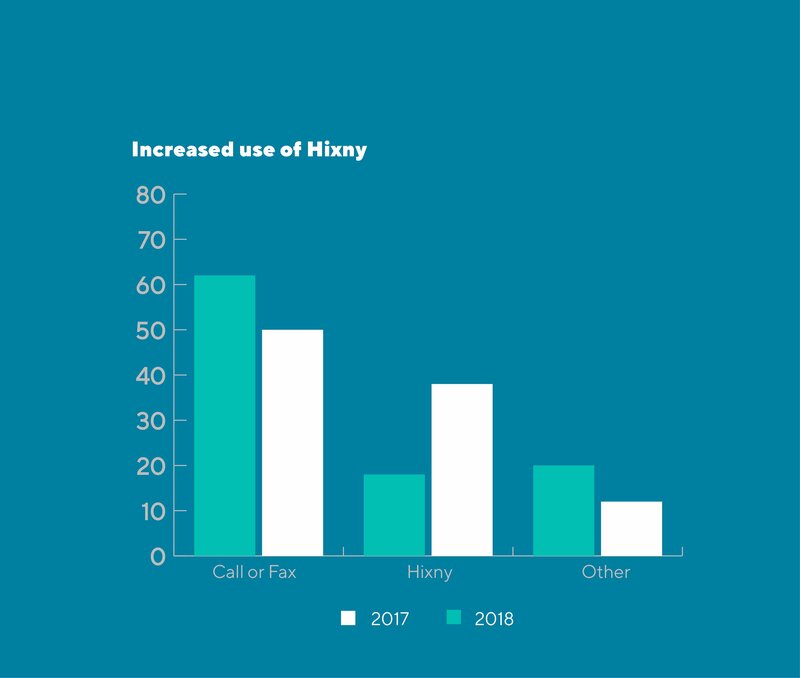 Use of Hixny doubled among survey respondents, while calling and faxing decreased by 20 percent.